Solar wind flowing from the indicated coronal hole should reach Earth on Jan. 27-28. Credit: SDO/AIA. 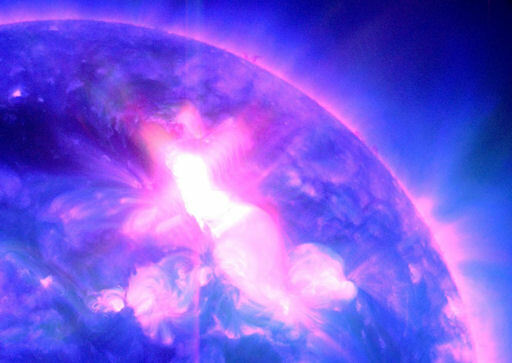 RADIATION STORM IN PROGRESS: Solar protons accelerated by this morning's M9-class solar flare are streaming past Earth. On the NOAA scale of radiation storms, this one ranks S3, which means it could, e.g., cause isolated reboots of computers onboard Earth-orbiting satellites and interfere with polar radio communications. An example of satellite effects: The "snow" in this SOHO coronagraph movie is caused by protons hitting the observatory's onboard camera. The Solar and Heliospheric Observatory (SOHO) and NASA's STEREO-B spacecraft detected a CME rapidly emerging from the blast site: movie. Analysts at the Goddard Space Weather Lab say the leading edge of the CME will reach Earth on Jan. 24 at 14:18UT (+/- 7 hours). Their animated forecast track shows that Mars is in the line of fire, too; the CME will hit the Red Planet during the late hours of Jan. 25. This is a relatively substantial and fast-moving (2200 km/s) CME. Spacecraft in geosynchronous, polar and other orbits passing through Earth's ring current and auroral regions could be affected by the cloud's arrival. In addition, strong geomagnetic storms are possible, so high-latitude sky watchers should be alert for auroras. Magnetic storm alerts: text, voice. "This was amazing," he says. 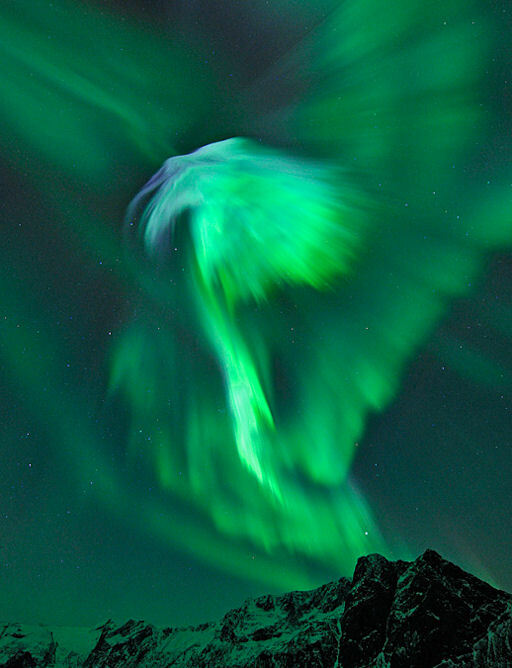 "It was a wonderful experience to see these stunning auroras." NOAA forecasters estimate a 10% - 25% chance of continued geomagnetic storms tonight as effects from the CME impact subside. The odds will increase again on Jan. 24-25 as a new CME (from today's M9-clare) approaches Earth. High-latitude sky watchers should remain alert for auroras. Aurora alerts: text, voice. "The CODAR transmitters are located all around the coast and are used for mapping the ocean currents to a distance of about 200 miles," Ibelings explains. "These signals also propagate through the ionosphere so they can be picked up all around the world. 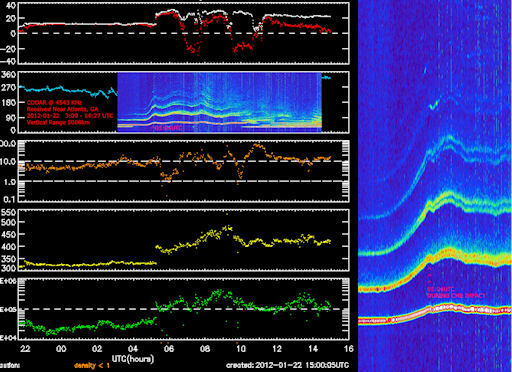 The signals are almost perfect for ionospheric sounding since they are linear chirps. I capture the chirp with a receiver locked to GPS both in frequency and time. I then de-chirp the waveform so I can extract the time of arrival information at my location." The CODAR echoes show ionization layers shifting vertical position by some hundreds of kilometers, changes that surely affected the propagation of HF radio signals in the aftermath of the impact. More information about Ibelings' observations may be found here. On January 23, 2012 there were 1272 potentially hazardous asteroids.